Oldsmar Wheel Alignment | Murray Motive - Murray Motive, INC.
What is included with your Wheel Alignment? Then, while on the alignment rack, cameras are used to compile initial alignment readings. Manufacturer’s recommendations specifically for your car, make, and model are employed in adjusting camber, caster and toe angles. What are the symptoms of a car that needs an alignment? Poor alignment can be recognized by a vehicle that pulls to one direction or the other; has tires that squeal and demonstrates uneven tire wear. It can also be determined by simply driving straight down the road and noticing if your steering wheel is crooked. Wear and tear over time - as cars age, the tire rubber starts losing their elasticity. When this happens, the ball and socket Joints start to loosen. 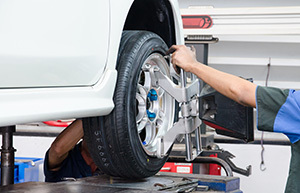 Why is a wheel alignment important routine maintenance? Your Oldsmar wheel alignment makes you safer and can vastly improve the life of your tires. Improperly aligned tires wear quicker and will require replacement more often. In addition, tires that are not alignment properly can cause unsafe driving conditions. At Murray Motive, we can help get you headed in the right direction. Contact Murray Motive today and let’s schedule your Oldsmar wheel alignment today!.